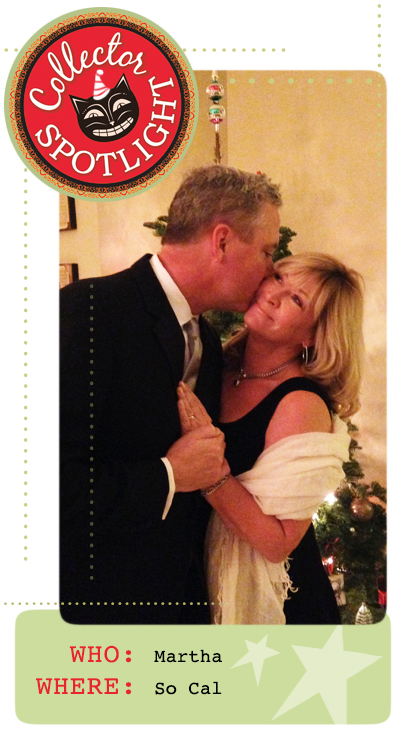 * Pictured above is a sweet photo of Martha and her hubby, stealing a kiss near the Christmas tree! J: How did you learn about my folk art? J: I do love how the web can really connect us all so instantaneously! 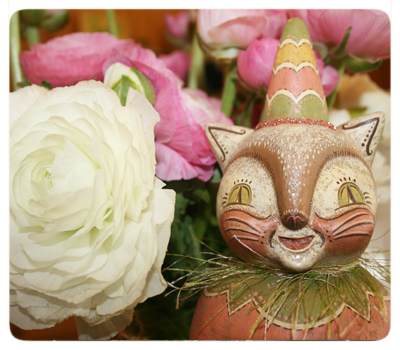 I am grateful that you found me via a basic search, and we became fast friends through our common love for folk art! 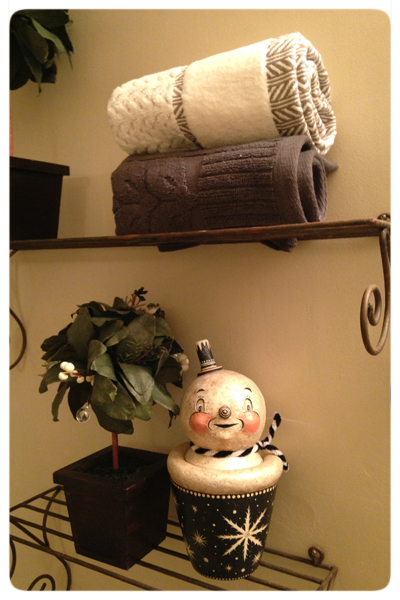 * I love this wall nook that Martha has donned with some of her Johanna Parker Design snowmen! A whimsical pedestal sconce is the perfect spot for one of my limited edition shelf sitters that she acquired in person at our open house. 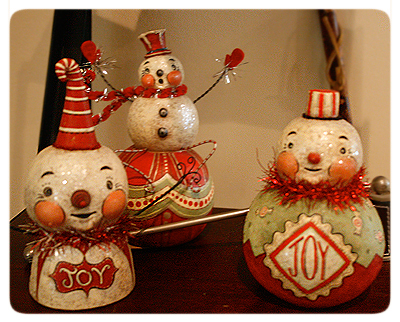 The sweet medley of snowmen below are all original creations, and look quite content to be sharing the shelf! 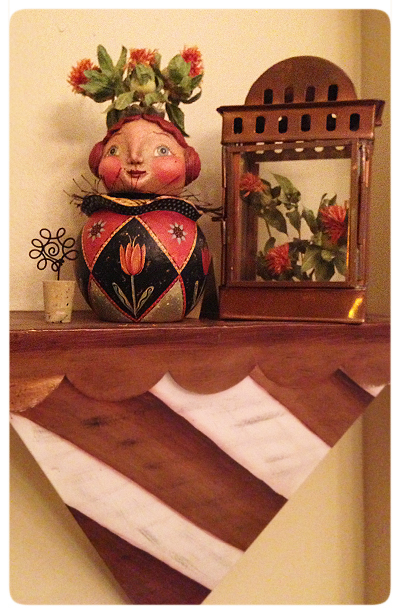 * Taking a closer peek at her nook of Johanna Parker Design original snowmen reveals all smiles and delight! 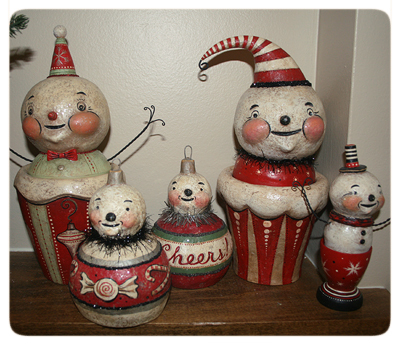 The egg cup and ornament ball characters look to be older pieces, and the larger guys are candy containers with removable heads that likely date back a few years too. * What a festive vignette this is with the "Happy Holidays" sign and the jolly snowman character ball original in the foreground. He looks to be singing a Christmas song! 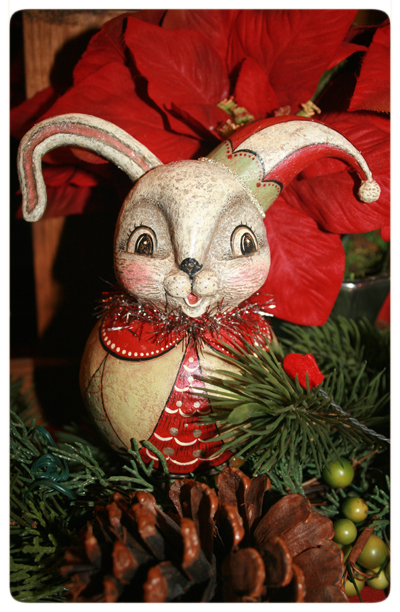 Martha nestles him in a bed of greenery and red berries which makes him pop! Martha: I think my first originals are from 2006, or 2007 at the latest. I remember I sent you an email and you were so kind and happy that I loved your work! Love your creations and would like to be notified when you have more items to sell. 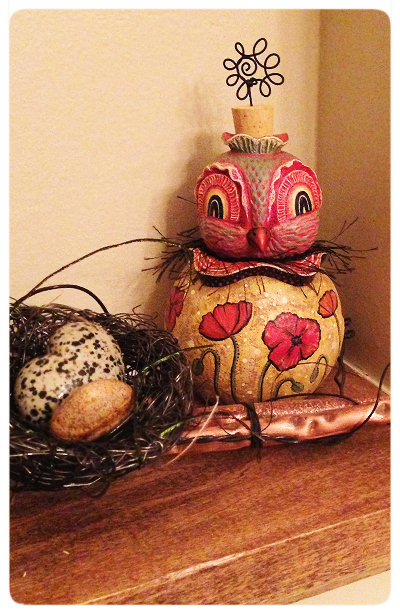 In your article in B H and G I loved the owl on the top shelf. I'd love to have something similar. Hope you can add me to your email list! 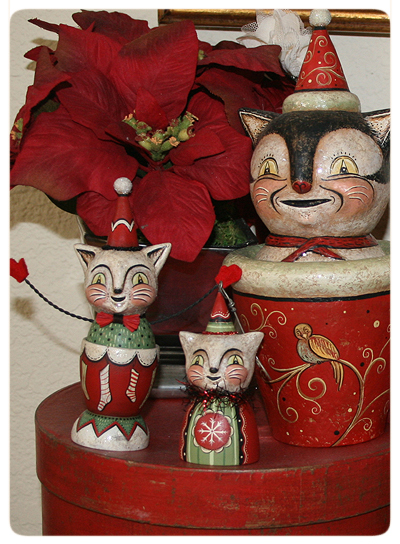 * Another sweet trio of JPD originals ~ this time a gathering of folk art cats each offer a sweet smile for the season! 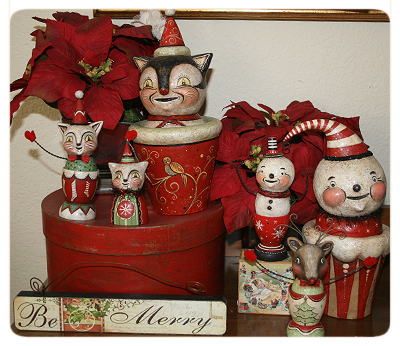 * Here's a wide, including the cat trio and some of their wintery friends ~ all JPD originals... Martha displays them using painted boxes of varying heights, which is a great way to add interest and create a more pleasing group. The poinsettias add a soft backdrop and tie the collection together. 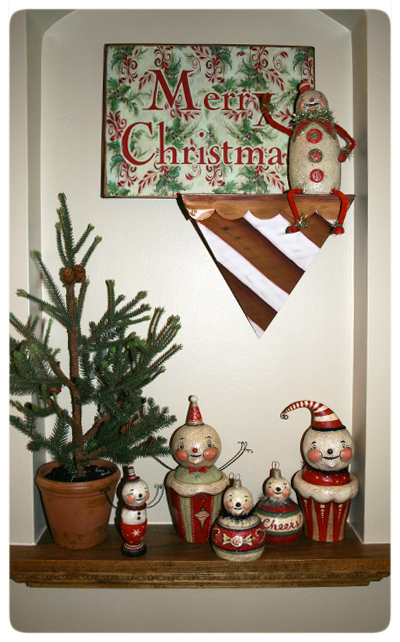 * Again, Martha adds more interest to her holiday displays by varying the heights of her art pieces. 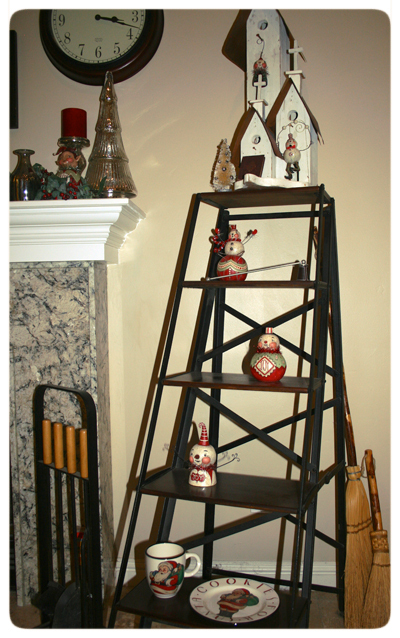 A stylized ladder serves as the perfect shelf to single out each piece! 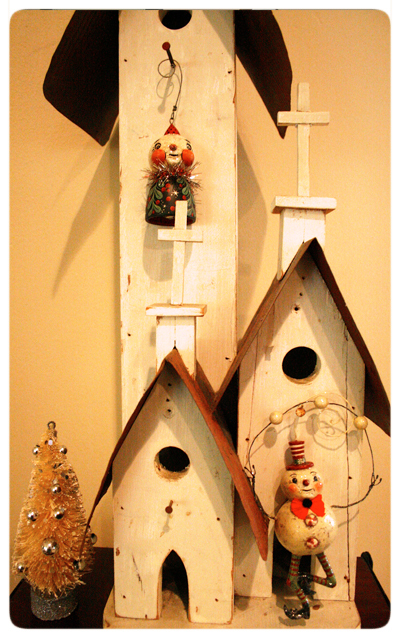 * And she tops off that unique shelf with a collection of primitive birdhouse chapels that serve as an exhibit for a pair of snowmen ornaments. 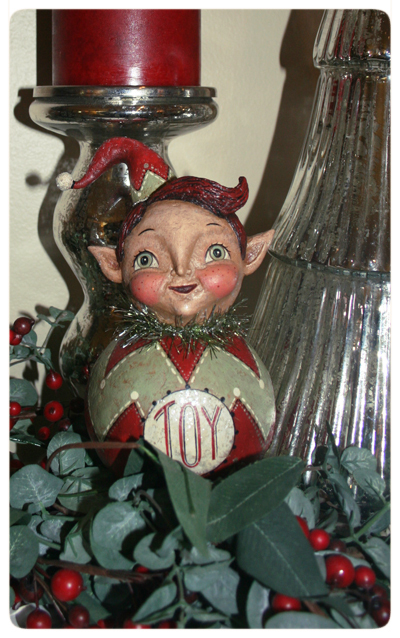 The dangling snowman above is an original ornament bell from my 2013 collection, and the juggler below is a current Johanna Parker reproduction piece, offered via Bethany Lowe Designs. Martha: I have never had the pleasure of going to the Halloween and Vine or Ghoultide. But I have gone to your place twice and bought plenty at your holiday open house! I have had amazing luck with the Collector Catch! I think I have a Johanna Sixth Sense and get an impulse to check your website! HAHA.....lucky me! I have gotten one piece from your lucky list. I have found some originals as they pop up on Ebay every now and then. And, I am pretty quick and usually grab one at each websale! Loved it when I got my new Mac! J: You do have quick fingers when it comes to the web sales, and it does help to have a fast connection! I think those that have a growing affinity for my one of a kind pieces have learned to be snappy when I host a web sale. Pieces often sell quickly, and on my end, there is a frenzy as I sift through my inbox. Of course, face to face sales are always the best, and it's a fun way for me to meet the collectors and vice versa. It has been a pleasure to see you more than once at our Holiday Open House, and I appreciate the extra journey you make to come out to see us! J: Do you have a favorite piece in your collection? Martha: Hmmm.....gosh I love them all! Of my Halloween, it might be my beautiful Cat Candy container, the one that's black and white with the crescent moon with mouse. Is her name Dolly Crescent?? But from my Christmas I think it's hard cuz they are all out and I don't want to hurt feelings! The ornament bells are FAB! Love my 1st reindeer and Elf you did.....Love my Joy snowman ball, Tippy Tophat, Ronald Ruby and of course Snow Joe Oreo!!! 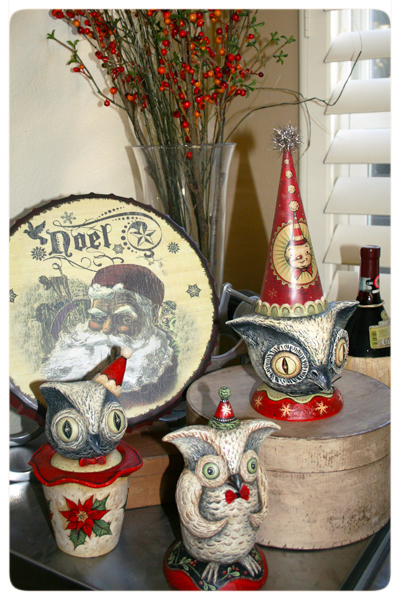 Love Swirly Santa....ok I really do love them all! J: I know, I know... It've very difficult to pick a favorite, and I agree, we don't want to hurt any of their feelings! I have a sense that they all feel well-loved in your home... We will have to post a pic of "Dolly Crescent" when I share your Halloween collection here on my blog this coming Fall, 2014! * Above are some of Martha's original Johanna Parker Design ornament bells! I have been making these for several years, and they are always a popular pick amongst collectors. I am truly lucky to make as many as 10 each year. I only got to 6 original bells for 2013. 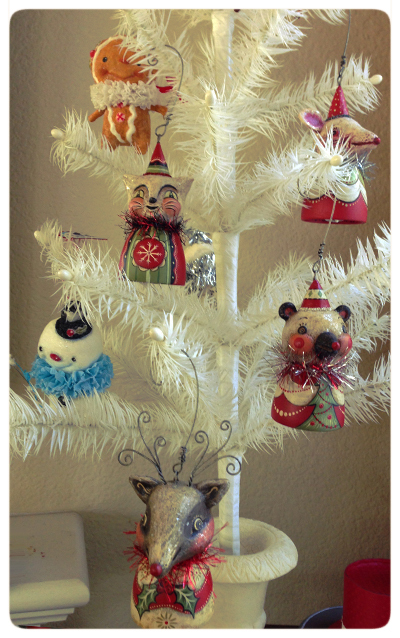 Included on her feather tree are a few sweet ornaments from fellow folk artist, Flora Thompson! * And, yes, after Martha suggested I make a reindeer, I indeed did! 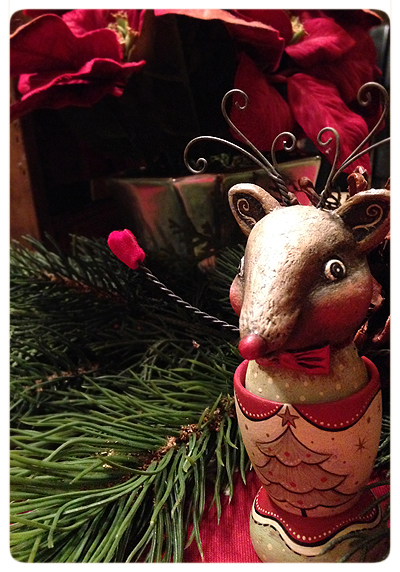 I think she snagged one of my first reindeer egg cup characters at our Holiday Open House in 2011! Here he is, complete with mittens! 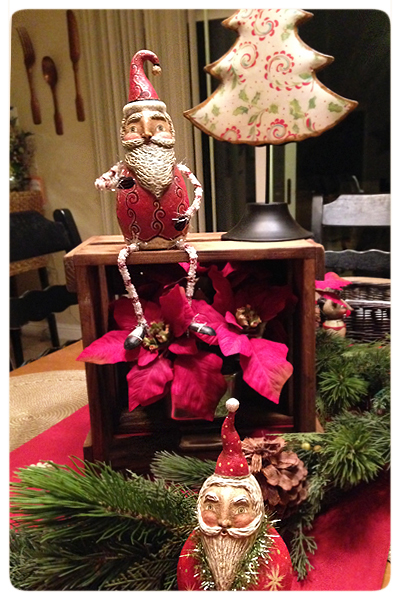 * If you are wondering who is "Swirly Santa," well he is the whimsical sitter pictured above. He gets his name from all the black and silver swirl patterns that I painted on his body and hat! He proudly takes a seat at the kitchen table, atop a crate. 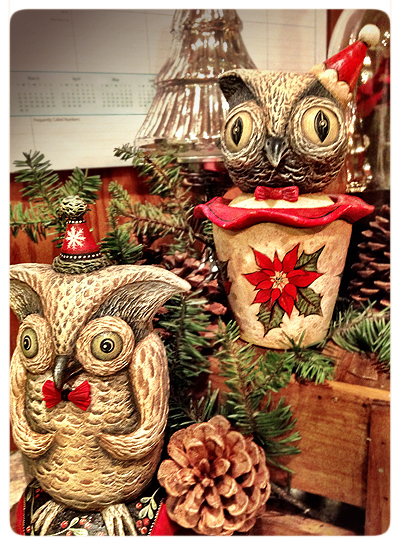 Again, Martha works her magic by accessorizing her collectibles with other found objects, greenery and holiday pieces that work well to create a memorable scene for the senses! Martha: Loved that I had said reindeer at some point and you did! Love that I said elves, as I know others did too, and you did! And that I got the first ones of those!!! Hmmmm.....I would love a Christmas Skunk! They were my fav animals growing up and I think the black and white would be cute! Also a huge chipmunk fan.....love the stripes! Oh, and foxes are awesome too! J: Ahh, thanks for the suggestions! I can certainly imagine that both a Christmas skunk and chipmunk and even a fox character would add more holiday fun and variety to the mix! 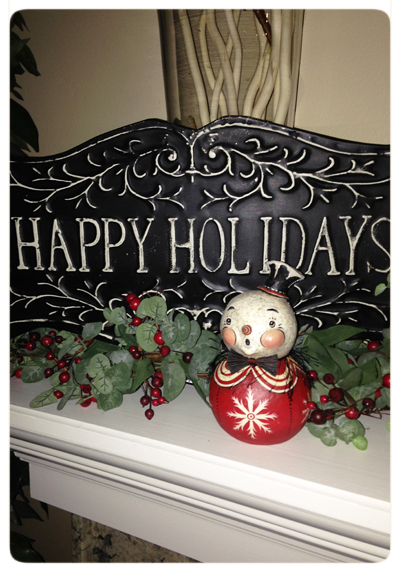 * I love the simplicity of this snowy vignette, featuring my reproduction snowmen. 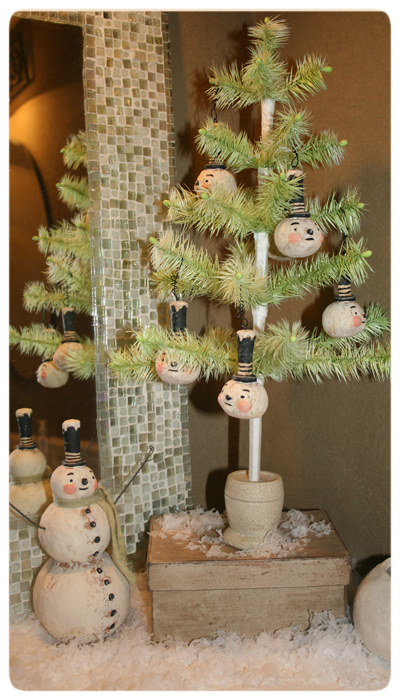 The sweet green feather tree softly accents the mosaic mirror, and all the primitive snowmen characters add that special touch of winter spirit! The bits of snow around the base really complete the scene, adding texture and softness! * At last for the Christmas imagery, I am including a series of Martha's sideboard where you can see the various groups of her Johanna Parker Design originals. 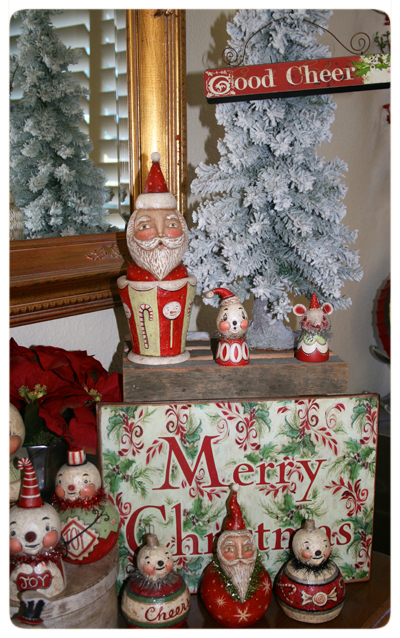 The holiday red hues really pop and express "Good Cheer" indeed! * And my sweet ruddy-haired girl now wears a bouquet of dried posies... 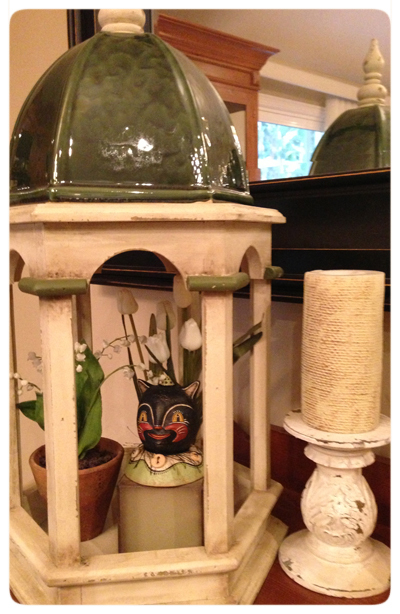 Both of these unique flower keepers serve as floral vases as well as decorations. 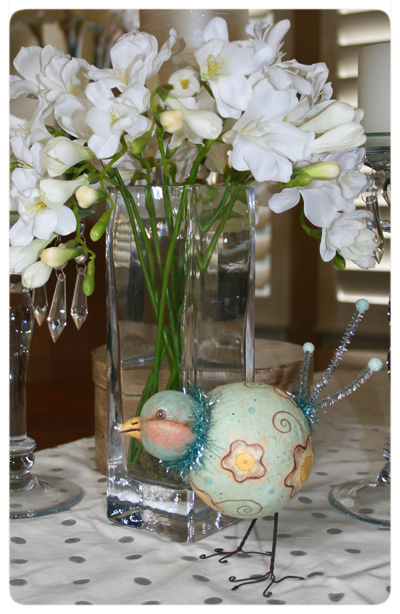 * And, spring wouldn't be quite complete without the hope of a blue bird. Here Martha invites that spirit of hope via this special standing bird characters, one of which I created a few years back. Sheltered under a lovely white bouquet, he brings delight to the table, year after year! I hope you enjoyed Martha's photos! You can share your thoughts here in the comments portion of this post. Just click the "comments" link below to leave a message for both of us! THANK YOU! MERRY CHRISTMAS & Happy Collecting too!